Western blot analysis of extracts from various tissues and cell lines using ALDH2 Antibody. 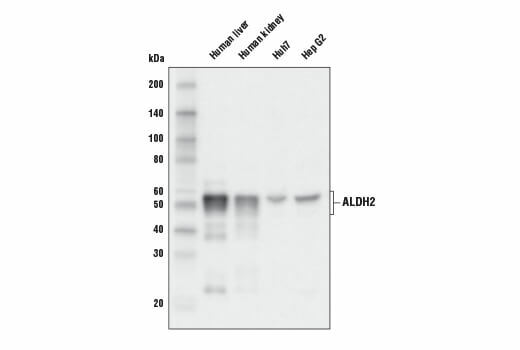 ALDH2 Antibody recognizes endogenous levels of total ALDH2 protein. Polyclonal antibodies are produced by immunizing animals with a synthetic peptide corresponding to residues surrounding Val348 of human ALDH2 protein. Antibodies are purified by protein A and peptide affinity chromatography. Aldehyde dehydrogenase 2 (ALDH2) is a member of the aldehyde dehydrogenase superfamily (1). The enzymes in this family catalyze the oxidation of a variety of aldehydes, leading to their detoxification (1, 2). ALDH2 activation correlates with decreased ischemic heart injury, suggesting an essential role of ALDH2 in cardiac protection from ischemic injury (3). In addition, ALDH2 is the primary enzyme for aldehyde oxidation in hematopoietic stem cells (4). ALDH2 is required for protecting these cells from DNA damage caused by acetaldehyde and has a critical function to counteract genotoxicity (4, 5). Chen, C.H. et al. (2015) Proc Natl Acad Sci U S A 112, 3074-9. Tan, S.L.W. et al. (2017) Cell 169, 1105-1118.e15. Chen, C.H. et al. (2008) Science 321, 1493-5. Garaycoechea, J.I. et al. (2012) Nature 489, 571-5. Garaycoechea, J.I. et al. (2018) Nature 553, 171-177.